Ceres Organics LSA Power Blend with Cacao & Maca is made with linseed, flax and sunflower seeds and almonds and then the added boost of cacao and maca. This super food combination is a great source of fibre, protein with the antioxidant properties of organic cacao and maca, which are all highly effective adaptogens. Sprinkle as much as you want to your cereal, cup of yogurt and smoothies. 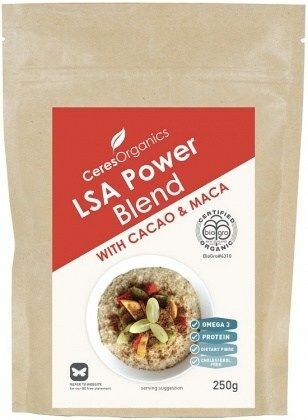 Ceres LSA Power Blend also makes a suitable ingredient to add to your baked goods and raw desserts. Ingredients: Lsa (Linseed/flaxseeds, Sunflower Seeds, Almonds)  80%, Cacao  14%, Maca  6%. All ingredients organic.